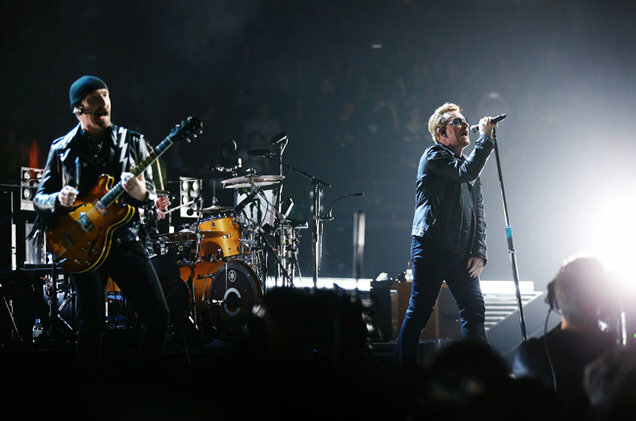 After the horror of the Bataclan theatre concert, U2 returned to Paris for the first time for a concert on Sunday, 6th December, 2015 and they paid a touching tribute to the victims of the November 13th terror attacks in the country. The Irish rockers had been scheduled to perform in France’s capital the night after the atrocities took place, but had scrapped off their plans. The massacre had occurred at the Eagles of Death Metal show and 89 of the gig-goers became victims of the attack. Subsequently, U2 decided to reschedule their first of the two shows in Paris, INNOCENCE + eXPERIENCE show on Sunday. There were more than 20,000 revelers and Bono, the band’s frontman first stepped onto the AccorHotels Arena stage and shouted ‘Vive Le France’. U2 dedicated their hit song titled Pride (In the Name of Love) to those who had lost their lives in the terrorist attack. The giant screen in the venue showed a blue, white and red peace and love signs and names of each of the 130 victims were displayed on it. The death of hundreds of others who have passed away due to senseless acts of violence and terrorism were also acknowledged by Bono. He made references to those who had lost lives in various terror incidents in San Bernardino, Istanbul and Beirut and said they had to stand together against those who had false ideologies about the god they serve. There were reports that U2 had extended an invitation to Eagles of Death Metal to come with them onstage as they returned to the city for the first time after the horror of the concert, but they didn’t make an appearance. Nonetheless, Patti Smith, the veteran musician did come out as a surprise guest and performed three songs with the band including her unique anthem People Have the Power.